The next Total War game, Attila, is going to be exceedingly good at burning things if this new trailer is anything to go by. Creative Assembly more aptly call it “Dynamic Fire Simulation”: fires can break out from burning projectiles, and spread from building to building according to the weather conditions. Sieges themselves now possess multiple “escalation states” too. Conduct your attack early, and you’ll face the full might of the defenders; with robust walls and high morale. If you prolong your siege however, the environment and defenders will slowly start to wilt; things may be already burning before you fire a single arrow. With the new dynamic fire simulation, you might not need to even set foot inside the defenders walls to win a siege. Once a building catches fire due to a burning projectile or pillaging marauders, it will slowly spread to nearby structures. The weather system also plays a part; if there’s a strong wind about, expect fires to spread much more rapidly. If you’re like me and you’re the sort of impatient type of ruler, you often dive straight into a siege battle without dawdling around to drain the defending forces of men. 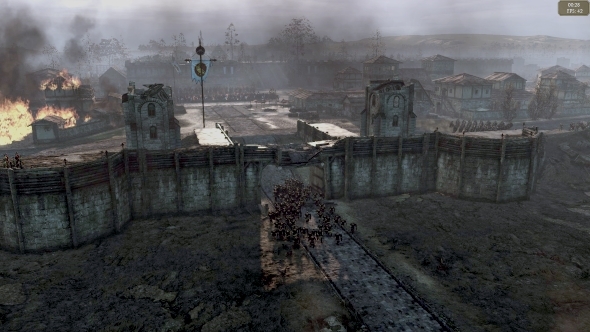 in Attila, it’ll be a little different thanks to the new multiple siege escalation states. If you attack headstrong, you’ll face the full garrison and defences that the city has to offer. Hold off however, and you’ll not only drain the armies population, but also slowly damage key defence structures too. The defenders do have one new advantage though: barricades. These are temporary defences that can be erected before the start of a city battle. While they can be broken by the attacking force, they provide a notable benefit to any unit mounted upon them. This gives the defender an opportunity to funnel the attackers forces into specific routes within the city, and often into traps and ambushes.